Cured in place pipe lining has come a long way since the days Simon Bull and his colleagues called the local ice wholesaler to stop their liner becoming the world’s largest and strongest flattened drinking straw. He is Lanes Group plc’s lining manager, responsible for directing teams that implement some of the UK’s most challenging pipe rehabilitation projects. In the mid-1990s, when he joined the Lanes lining team, the process of inserting a flexible liner into a pipe to create a durable new pipe-within-a-pipe – known as CIPP – was no less pioneering. But it was a little more hand-to-mouth. In those early days, almost every new job created a new first – longest liner, largest diameter liner, most liners installed in a single programme. The technology, as used in the UK, was still in its infancy. Which is where the ice cubes came in. Bull recalls the first major CIPP project Lanes was commissioned to carry out – installation of a liner 120 metes long and 600mm wide at a gas-fired power station in Wales. He says: “We had to wet out the liner, that’s impregnate it with resin, at our North Wales depot, near Chester, and buy ice from the local wholesaler to pack around the liner to stop the resin hardening. “Then we transported it as short a distance as possible to the power station and install it. That liner was hot cured, so had to be kept cold because the resin we were using would have started to harden in higher temperatures or if exposed to UV light”. In 2007, Lanes invested £2million to create a purpose-built pipe rehabilitation and lining centre in Eccles, Greater Manchester, where liners could be prepared and impregnated with resin, before being taken to installation sites in purpose-designed refrigerated lorries. It was a major financial commitment. But it reflected Lanes’ confidence in a ‘no-dig’ pipe rehabilitation technology that had clear benefits over the main alterative, which was to excavate and replace damaged pipes. Since then, pipe lining has developed hand-in-hand with advances in CCTV drainage surveying techniques, which allow sewer rehabilitation specialists like Lanes, working with civil and structural engineers, to assess and grade the quality of underground assets. Where pipes have been degraded by root infiltration, cracking, joint displacement – even leading to partial collapse – or chemical erosion, there is often an option now to line them rather than replace them. No-dig pipe lining has enormous advantages over excavation. Pipe lining is must less resource-intensive and costly, generating savings that can be passed on to the client. It can be carried out much more quickly. Periods of traffic management needed to repair wastewater utility pipes under roads can be shorter. Pipes in factories can be rehabilitated during the briefest production shut-downs. One track possession lasting hours may be needed to rehabilitate a pipe on a railway line, not several lasting days. CIPP rehabilitation also takes up less space, so is much less disruptive. Often, it is only necessary to set up controlled environments at both ends of the section of pipe being rehabilitated, which may be hundreds of metres apart. This is a major benefit on manufacturing sites that need continuous production. For utility repairs on roadways it could prove vital. In February 2018, the Department of Transport said it would help councils set up lane rental schemes by the end of 2019 to charge utility companies up to £2,500 a day for digging up the busiest roads at peak times. The aim is to encourage water, electricity, gas, and cable utility companies to speed up and coordinate their activities to reduce congestion. With its speed of application and small operational footprint, CIPP rehabilitation – applicable to waste water, gas, and cable pipes – looks like a real winner. Despite these benefits, the development of CIPP in the UK has been characterised somewhat by fits and starts. Old ways are hard to shake off. As with all innovations, clients can take time to convince. Pipe rehabilitation contractors like Lanes have had to educate and demonstrate efficacy every step of the way. Timescales involved may have contributed to a slower pace of adoption. Given that the technology needs to be in place, performing to high standards for decades, caution on behalf of water companies, power generators, and manufacturers is, perhaps, understandable. But increasingly, asset owners can see the case for CIPP rehabilitation has been made. What they might not realise is that it was invented to protect mushrooms. That is because agricultural engineer and inventor Eric Wood came up with CIPP when challenged to find a way to repair a duct in a mushroom farm, without disturbing the dimly-lit bed of mushrooms below. His answer was to line the duct with felt that had been soaked in resin. Once the resin had hardened, the duct was stronger than ever. And the mushrooms carried on growing. In 1971, broadly the same technique was used for the first time in the world to rehabilitate a sewer, the East End of London. Eric Wood impregnated a felt tube with polyester resin, wrapped it in a plastic sheet, and dragged it 230ft (70m) into the egg-shaped sewer, inflated it, then left it to cure. When tested 30 years later, it was found the liner was still outperforming the structural and strength standards set for it. That first liner started a new industry. Eric Wood patented his process and founded a pipe lining company that he sold to American investors. Since then, more than 35,000 miles of pipe – enough to go around the world over one and a half times – have been lined. Eric Wood’s lightbulb moment, in the dim confines of a mushroom farm, has sparked new lining technologies. It has also defined Simon Bull’s career in the drainage industry, as he and his colleagues at Lanes lined their way through many UK CIPP milestones. He joined Lanes’ newly-established rehabilitation division because, at the start, every lateral pipe had to be excavated, and access created so the liner could be cut out by hand, restoring the individual connections. Thankfully this work is now completed by robotic cutters. It was Bull’s job to dig down to those connections. Soon afterwards, he moved across to be directly involved in installing the liners. Easier work, he says. And more interesting. Then, Lanes invested in its first cutting machine, so lateral connections could be restored remotely. The technology, also in its infancy, allowed Lanes to line a 100m-long 225mm-diameter pipe across heathland that was a site of special scientific interest in Dorset. Then, in 2004, Scottish Water commissioned what was then said to be the biggest lining programme of its kind in the world. Lanes worked on the contract with a partner, then became the sole contractor. Lanes mobilised five pipe lining teams, six point lining teams (point lining, or structural pipe repair, is the installation of liners up to two metres in length), and two cutting teams. For three years, the Lanes teams worked their way across Scotland, installing liners in pipes ranging in diameter from 150-750mm, as part of a planned and preventative maintenance programme. After that, a similar large-scale installation programme was delivered for United Utilities. Lanes, along with other civils drainage specialists, are waiting to find out whether AMP7, the latest round of five-year water investment plans, will earmark equally ambitious plans for sewer lining programmes. Water companies are under pressure from the water regulator Ofwat to commit to significant investment to repair and replace ageing infrastructure. With lining being a proven methodology to renew pipes cost-effectively, water companies could build lining and rehabilitation plans into their capital delivery frameworks with values of between £2m to £15m a year. At that time, the most common lining method used in the UK was hot-cure CIPP. With this approach, the liner is inserted into the pipe by being attached at one end, then turned inside out – or inverted – into the pipe. The inversion is formed by creating a head of water, delivered to site by a jet vac tanker. Using either a scaffold tower or a sluice to create the head of water this then provides the necessary force to invert the liner and turn it inside out. The water is then heated to 90 degrees centigrade, accelerating the curing of the resin. Once the process is complete, the water, now contaminated with trace amounts of styrene from the resin, is pumped out, and must be disposed of as hazardous waste, to ensure environmental compliance. Meanwhile, over on Continental Europe, a new CIPP technique was gaining favour. When installation engineers noticed that some resins would cure in sunlight another lightbulb came on. UV lining had arrived. UV CIPP lining has some specific advantages over hot cure CIPP. It needs less equipment, which takes up less space, and less time to set up and dismantle. The curing times are shorter. Also, it creates none of the hazardous styrene water which adds to environmental risks during installation, and cost during disposal. Game, set, and match to UV you might think. Certainly, UV lining is very popular across Europe, especially in Germany, France, and Holland. One reason is that sewers and drains in those counties often have straighter pipe runs, which better suit the UV light systems used to cure the resin. Lanes, and its sister company, UKDN Waterflow (LG) Ltd, have been pioneers in the use of UV lining in the UK, and sees it taking up a bigger share of lining projects in the years to come. That does not mean that hot water CIPP has had its day. It is still the best option where there are bends in pipes being lined, and is often the better choice where there is a need to install chemical resistant liners. Lanes is continuously pushing back what is considered possible, though. It is an approach which has won the company eight UK Society of Trenchless Technology (UKSTT) awards in the last ten years alone. For example, in 2016, it installed the UK’s first chemical resistant UV liner in the Solutia chemicals factory in Newport, South Wales, a project that won one of those UKSTT Awards. In October 2017, UKDN Waterflow (LG) installed two of the UK’s largest diameter UV liners – at 1600mm each – in a storm culvert in Barnet, North London, which had a 45-degree bend in the middle of it. Lanes is also pioneering the installation of UV liners in motorway drainage pipes as part of Highway England’s SMART Motorway programme. The installation work, between Junctions 16-19 on the M6, is strengthening pipes so vehicles can drive on the hard shoulder, at a fraction of the cost of replacing them. Bull can see further innovations, literally coming down the road. He says: “As the business gurus say, ‘we have always done it that way’ are the seven most expensive words in the English language, and that applies to pipe lining technology. “Advances in robotics, especially in cutting, will make post installation work easier and faster. 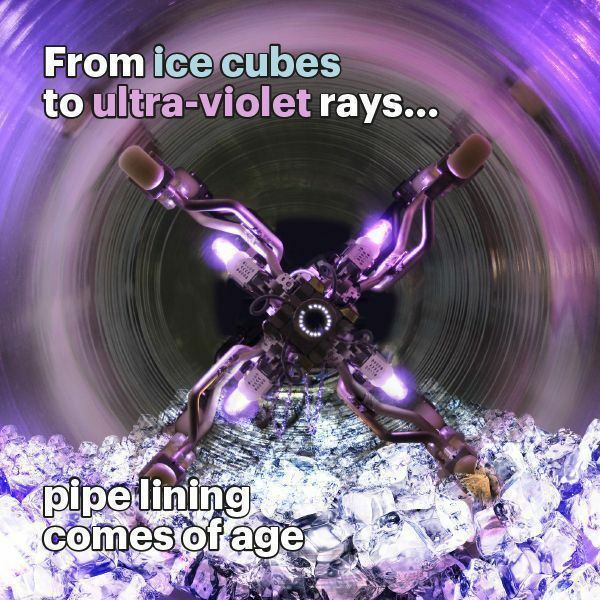 Steerable UV light trains will allow us to use UV CIPP in more complex pipe systems, and why stop at resin-cured liners? Why not use a 3D printing robot to print a liner onto the walls of pipes? Bull says whatever the technology, when lining underground pipes, success depends on the application of common sense and hard graft to overcome challenges unique to each project. It is clear, though, that innovation in pipe lining systems is moving on apace, and Lanes is determined to keep up with it. 3D printed pipe lining: another lightbulb moment? You heard it here first.